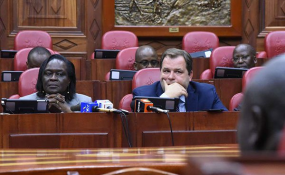 Transport Principal Secretary Esther Koimet, left, and KQ CEO Sebastian Mikosz at a meeting on the proposed plan to manage Kenya Airports Authority on February 26, 2019. The confidential report, which was submitted to the Transport committee of the Kenyan parliament, means servicing loans accounts for up to 11 per cent of the airline's operating costs -- way above the global average of five per cent. For the first time last week, Kenya Airways revealed that 11 firms including Bank of China Aviation, China Development Bank Leasing, Nordic Aviation Capital, GE Capital Aviation Services and Aviation Capital Group bankrolled the carrier's leasing of 20 aircraft, which is half its fleet. The carrier's chief executive Sebastian Mikosz, said Samburu is owned by Karen Karita Ellerbe, Jonathan David Herrick, Evert Brunekreef and Christopher Bryan, while Tsavo Aircraft Financing LLC is owned by the Wilmington Trust Company registered in the US. And in a revelation meant to anchor its role as the key tenant at Nairobi's Jomo Kenyatta International Airport, KQ disclosed that it pays $650 million annually to the Kenya Airports Authority--for use of the airport as its hub. "Furthermore, KQ pays KAA the Airport Pax Service Charge [APSC] that is dependent on the number of passengers departing from Kenya with the airline. "In KQ's case, that fee amounts to $430 million annually, accounting for approximately 50 per cent of JKIA's total revenue from APSC per year," the airline says in its report to parliament. KQ has in the past two years revealed that it spent $170 million to clear its tax obligations with Kenya Revenue Authority, but carries security guarantees from Exim bank for six of its Boeing 787 Dreamliner's, one Boeing 77-300 aircraft and one GEnx Engine. This means that under the JKIA revenue structure, 81 per cent of KAA revenues come from aeronautical services including landing charges, air passenger charges, parking charges, airlift fees, fuelling revenue and fuelling up-lift fee--partly contributing to Kenya Airways' high cost base. "It is crucial to grow non-aeronautical revenue in order to balance the revenue streams and cut the cost of core aeronautical services, making the airport more competitive to attract more traffic," said Kenya Airways. "A KQ captain earns on average 11 times more than the average employee in other high salary sectors, and 29 times more than the private sector average....While significant salaries of the pilots are not unusual in the industry due to influential trade unions and political pressure on national careers, remuneration of the Kenya Airways' pilots is substantial even in comparison with their peers from wealthy economies," the airline notes. But despite KQ's spirited effort to defend its proposed takeover of JKIA management, Kenya's Transport ministry officials appeared to beat a retreat. "Following concerns that have been raised by the public, we are now exploring other options of delivering the objectives of the government to consolidate our aviation sector. "Once an agreed option has been identified we will submit the same to the Cabinet for approval," Kenya's transport cabinet secretary James Macharia said.